But how long will the furnace filter last under normal conditions? This is a good question, since changing the filter regularly is an essential part of protecting your furnace, your comfort, and your energy bills. First, a word about what the furnace filter is for. It’s not to improve air quality in the house. It can cause air quality to decrease if left in place too long, but its normal function isn’t to clean the home’s air but to protect the furnace. The filter cleans the air coming through the return air ducts and into the furnace cabinet. The blower fan in the air handler pulls air from the house through vents, then sends the air through the furnace to warm it and on into the supply ducts. 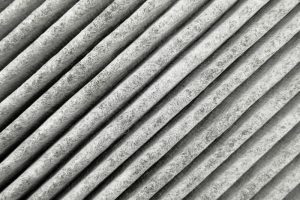 The furnace filter stops dust and other debris brought in through the return ducts from contaminating the inside of the unit and harming its ability to work at peak condition. The filter stops most larger particles that may come through the return ducts: household dust, lint, dander, etc. In most cases, the filter is located either behind the grill of the return air vents or next to the air handler where the return ducts connect to it. To change it, simply slide out the old filter and put in a new one. The filter type: The stronger the filter, the longer it can last. A simple panel filter made of fiberglass mesh will probably need to be changed monthly. A pleated filter made of polyester can often last for three months. There are strong filters available which may only need replacement every 6 months, but we don’t recommend going too strong since it will cut down on airflow to the furnace. The frequency of use: The more you use the air handler in the furnace (regardless of whether the furnace itself is running), the quicker debris will build up in the filter. For regular steady use over winter, you can stick to the timetable above (1 to 6 months, filter depending). If you use the furnace more or less often, adjust the time—but we advise you take a look at the filter monthly to check on it. If it’s fully congested, make the change, and note the frequency for further reference. To help you remember when you put in the filter last, use a marker to write the date the filter was put in along the plastic frame. Quality Is the Cornerstone of Our Success at Purl’s Sheet Metal & Air Conditioning. Speak to us today for furnace service and indoor air quality help.